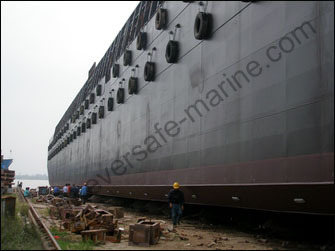 Eversafe marine launched a DWT 20,000 river barge for a client in Jiangsu Province on 20th May. That inner river barge is 120 m long ,32 m wide and designed for ore transportation. The launch ramp is natural ground compressed with slight concrete content. Its slope angle is 1/60. Barge is the most easy vessel to be launched with marine airbags because of its vast flat bottom. 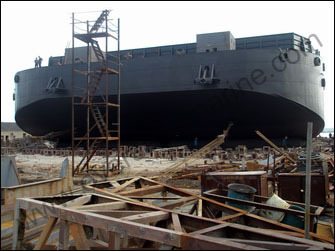 However some accidents often happen to barge launching, sometimes the vessel structure may get damaged. The bending capacity of vessel bottom must be considered when people apply air bags to lift and launch vessel. 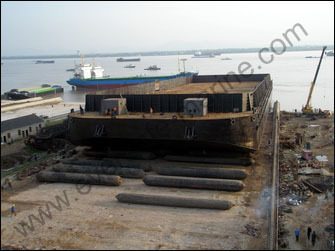 The launching weight of barge is 3700 tonnes. 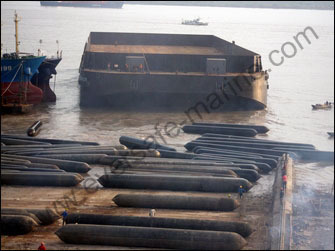 Total 40 pieces airbags were arranged in two rows, their maximum pressures were set at 0.08 Mpa which can ensure the safety of barge structure. When the river water rose, the barge was released into water smoothly. Because of limited water area, Eversafe team deployed some special measures to limit barge movement when it got floating freely.